Increasing club head speed is key to adding distance. For golfers who want their shots to travel farther off the tee, increasing swing speed is one way to make it happen. Longer drives leave shorter approach shots to the green and more opportunities for low scores. Merely swinging harder won’t cut it, but consider other methods that help increase club-head speed and promote longer drives and more-powerful shots. When golfers swing hard to try and increase their distance, they often throw their bodies out of sync and make their distance problems worse. To ensure a powerful downswing, PGA Professional Paul Marchand suggests that right-handed golfers start their downswings by rolling onto the inside of their right foot and the outside of the left foot while sitting back slightly on their heels. This creates more room for the arms and allows the left arm to extend more on the follow-through, increasing distance. Another way to increase swing speed is to properly release the wrists. 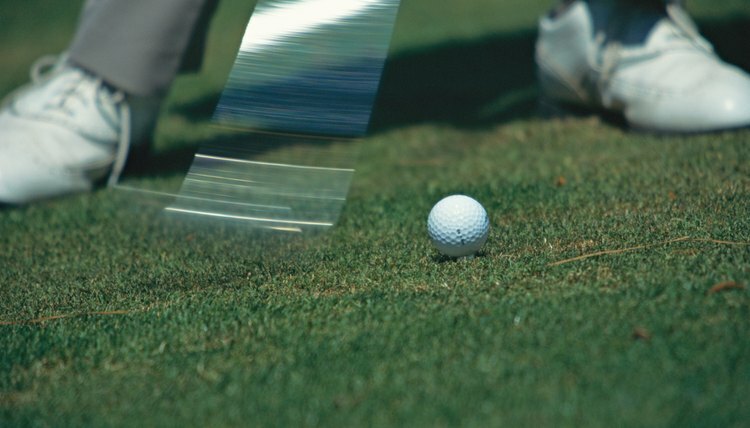 Golfers who slice have a similar problem to those with slow swing speed--they don’t fully rotate their wrists after impact, causing a problem called, “chicken winging.” To practice hitting through the ball, try swinging the club with just the right hand. When the club reaches the area around the knee on the downswing, begin unhinging the wrist and “throwing” the club at the target. After hitting a few one-handed shots, try hitting shots with both hands on the club. If the ball begins to hook, rotate your body more. Golfers looking for more club-head speed can help themselves off the course. Developing a strong back and abdominal region will aid your golf game. Be sure to stretch your back, arms and shoulders before hitting the driving range or golf course and exercise in-between rounds. A good golf-centric exercise is to lift a 3 to 6 lb. medicine ball with both hands as you would in the golf-swing takeaway. Then, complete the golf swing in a balanced motion. This exercise will help isolate the muscles used in the golf swing.